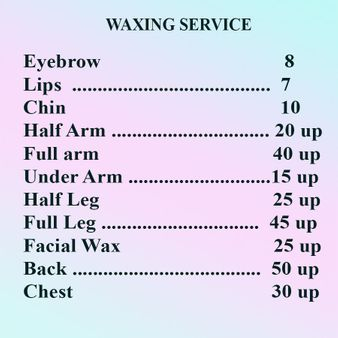 In this process you will get your nails shaped, cuticle cleaned, hands and arms massaged. Lotion or cooling gel will also be applied to keep your skin moisturized. Then finish with a color of your choice. Want your manicure’s colors last up to 2 weeks without loosing the shine and no- chip? 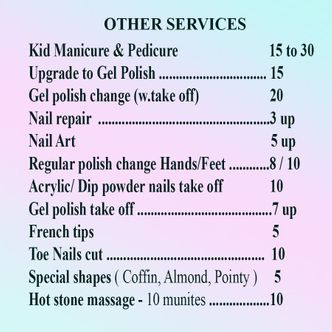 Good news that your question is solved with our Gel manicure service. We have a huge collection of all gel colors that are available in the market, more than 600 bottles of gel polish. We also use the latest technology OPI- LED machines that are harmless to your skin and cure colors in 30 seconds. We guaranty that you will love your nails more than ever before. We highly recommend this service because it contains all natural herbal ingredients that help your skin feel softer and smoother. Your hands will look younger with our herbal manicure treatment. Be confident to show-off your hands with healthy skin and beautiful nails wherever you go. Sit back and relax. Get your feet soaked in a peppermint bath while enjoy your back massage with our newest technology Human Touch spa chairs. Your toe nails and cuticle will be trimmed and cleaned. Sugar scrub is used to eliminate dried and dead skin. Callus will also be removed to leave you soft and smooth skin. Enjoy your foot massage with cooling gel, follow with hot towels to give you a total relax time of the day. On top of the regular spa pedicure we apply gel color of your choice to give your toe nails a shiny looking that lasts for a long time. Ideal for people who stay in the pool a lot or who are rough with their feet. 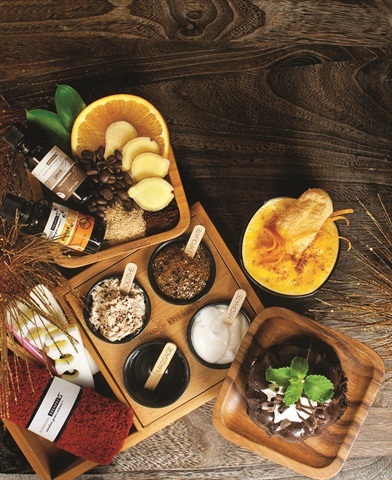 On top of the regular spa pedicure, you will get foot mask- flavor of your choice- applied to your legs and feet. Enjoy your extra foot massage with hot stones, then get your feet dipped in hot paraffin wax to moisturize your skin. Finish with hot towels and polish of your choice. We are proud to introduce our signature herbal treatment in our pedicure process to help your skin feel refreshed and your feet feel younger, healthier. Herbal pedicure also helps to remove winkles and age spots and re-energizes your feet. There are more than 10 different herbal flavors and scents that available for your choice. This process adds length to your weak nails, helps your nails look stronger and feel more confident. Same process as acrylic nails but powder gel nails is stronger, more durable, and looks more natural. This process adds length to your nails or overlay on your weak nails using all gel products. When finished, your nails not only feel stronger, but also look as real as natural nails. 100 percent chemical- free liquid gel is used. This product works best for people who have sensitive skin around their nails. Wear and feel as light as feather but last long and durable like acrylic. This process gives your nails a clean, natural look with permanent French tips that last long until your next fill- in. We have plenty of Mylar/glitter colors for you to choose from. Just tell us how you like your nails to be done, then we will create your own style.